Review: Heart-wrenching "Manchester by the Sea"
A haunting family tragedy, and its repercussions as they are felt across generations, is dramatized with unforgettable force and biting humor in Kenneth Lonergan’s “Manchester by the Sea,” one of the very best films of the year. At the beginning we are introduced to Lee Chandler (Casey Affleck), a Quincy, Mass., janitor who is quiet and deferential, except when he’s had a few beers in a bar, at which point he quietly lets his fists do the talking. This appears to be the pattern for a solitary soul, until a phone call draws Lee back to his hometown up the coast, Manchester by the Sea, with news that his brother, Joe, is near death. Arriving too late to speak to Joe, Lee steps into the role of uncle to Joe’s teenage son, Patrick (Lucas Hedges), only to learn that he had been named Patrick’s guardian, a responsibility he is loathe to take upon himself. In flashbacks we see Lee and Joe’s relationship as one of deep brotherly love, if tinged by the rough-hewn, ironic countenance of a Massachusetts fishing community. 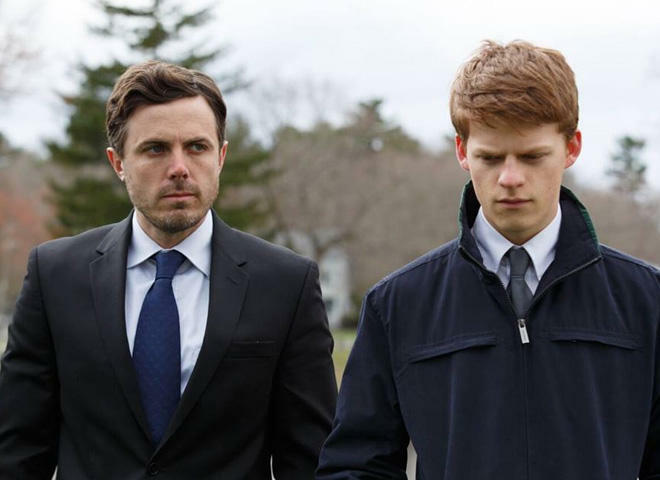 But it is through these flashbacks that we learn of an even greater tragedy -- life-altering circumstances that shaped the characters (and, indeed, the entire town of Manchester by the Sea) and which will not be revealed here. We learn why the marriage of Lee and Randi (Michelle Williams) ended, and why a dark reputation seems to trail Lee everywhere he goes. That darkness is only slightly buffed by Patrick, whose teen imperatives of hockey, playing in a terrible rock band, and messing around with not one but two girlfriends force the reluctant Lee to be a parent. Seething and tender by turn, he tries to guide Patrick but is barely up to the task, due to the stunted development of his own life. In his previous two films, writer-director Lonergan invigorated the well-worn dramatic possibilities of sibling bonds (the Oscar-nominated “You Can Count on Me”) and the urgency of teenage hope and despair (“Margaret”). Lonergan’s writing here, as usual, is honest and bold in its restraint (the briefest scenes cut off at just the right moment). Yet “Manchester by the Sea” (which premiered at Sundance and screens today at the New York Film Festival) is his most emotionally-moving film, in which characters struggle to overcome the sorrow and pain of the past but are inadequate to the task. Affleck’s restrained performance is stellar, boarding up the character of Lee behind eyes that both challenge the world and wilt in its presence. Williams is pitch-perfect in a swelling up of feelings that hurt too much to enunciate. In Kyle Chandler’s flashback scenes we get the depth of Joe’s importance in his family’s life, and the enormous hole that his death will bring. And as Patrick, Hedges is memorably charming and head-strong as that most challenging of all Earthly creatures: The teenage American boy. “Manchester by the Sea” (Roadside Attractions/Amazon Studios) will be screened at the New York Film Festival on October 1, 2 and 11, before opening in select theatres November 18. 137 mins. To watch a trailer click on the video player below.